Please complete the form below to access the complete report and in-depth interview transcripts. Spectrum is a finite resource. And it is a resource that has become extremely useful – necessary, in fact – to virtually all of us: individuals, businesses, public agencies. Picture what would happen if, for a single day, all wireless connections ceased to work. Yet overall spectrum utilization is quite low and inefficient – in terms of maximizing the transmission capacity of the spectrum across all bands, and meeting the expectations of users of wireless technologies at the right price points. Wi-Fi is an exception, because it carries almost half of overall IP traffic in just two bands: 2.4 GHz and 5 GHz. Licensed cellular bands are also heavily used and provide the wide-area coverage we need for ubiquitous and reliable connectivity. But there are other bands that are less intensively used; often they are allocated to users, such as the military, that need access to spectrum but do not use it heavily. Spectrum sharing opens up spectrum access to a larger number of users, while preserving the right of incumbent users to access the spectrum with the highest priority when and where required. The result is higher spectrum utilization – accomplished in a way that does not penalize anybody: incumbents, wireless operators, or end users. In addition, spectrum sharing frameworks may change how we use spectrum in a fundamental way, by enabling services and business models that are possible but not as compelling with licensed or unlicensed spectrum. 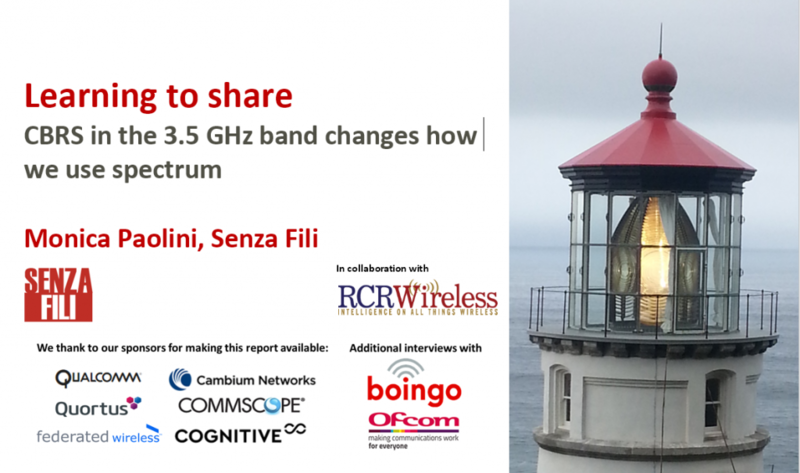 The CBRS 3.5 GHz framework in the US is an innovative take on spectrum sharing. Regulators and the rest of the wireless industry worldwide are watching the adoption of CBRS in the US because it has the potential to increase spectrum utilization and to create entirely new business models, and to strengthen existing ones (e.g., small cells or neutral host). In this report, we look at CBRS and other spectrum sharing approaches to assess the impact on the efficiency of spectrum use and the innovation in services and business models. Dynamic spectrum sharing is still in an experimental phase today, but it may become the default way to manage – and optimize – spectrum usage. – Spectrum sharing is moving toward more dynamic, and efficient, frameworks. – CBRS, with its three-tier coordination model, may become the first step in the wider adoption of dynamic spectrum sharing. – Real-estate players gain a larger role in CBRS, giving venue owners more control and deepening their relationship with mobile operators. – CBRS in the US and spectrum sharing elsewhere may solve small-cell business case challenges, through infrastructure sharing and neutral host models. – In the future, spectrum sharing may become the default (and not the exception) in wireless networks.